Mojitos are refreshing drinks, perfect for a warm day and though slightly more time consuming to make than other cocktails, they are extremely easy to create. 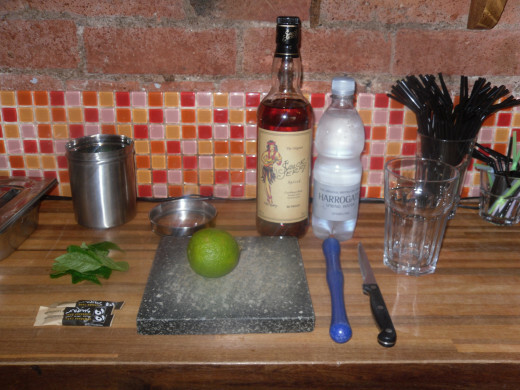 Note: This photograph shows all of the ingredients needed for a Sailor Jerry's Mojito, the rest of the hub is based on White Rum. Using a pestle/muddler to crush the ingredients together in the glass. Topped to the brim with ice. Topping up with sparkling water. Chop a lime in half and cut this half into segments. 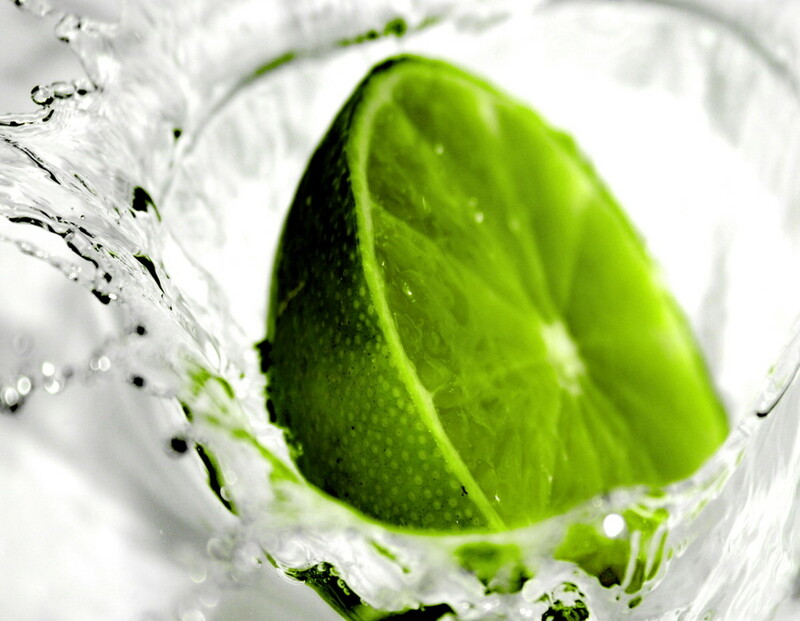 Add the lime to the glass. Add three sachets or teaspoons of brown sugar into the glass (or more if you prefer a sweeter cocktail). Measure out and add two shots of white rum to the glass. Crush these ingredients together with the pestle. Select your mint leaves. If they are very large, use no more than 6. Rip these into smaller pieces and add to the glass. If they are small mint leaves, use around 10-12. Now crush the mint leaves slightly using the pestle. You don't want to do this too much, just enough to break the leaves to release the flavour. Top up the rest of the glass with sparkling water. If you prefer a sweeter cocktail, try using lemonade instead. Stir the drink well using a spoon. 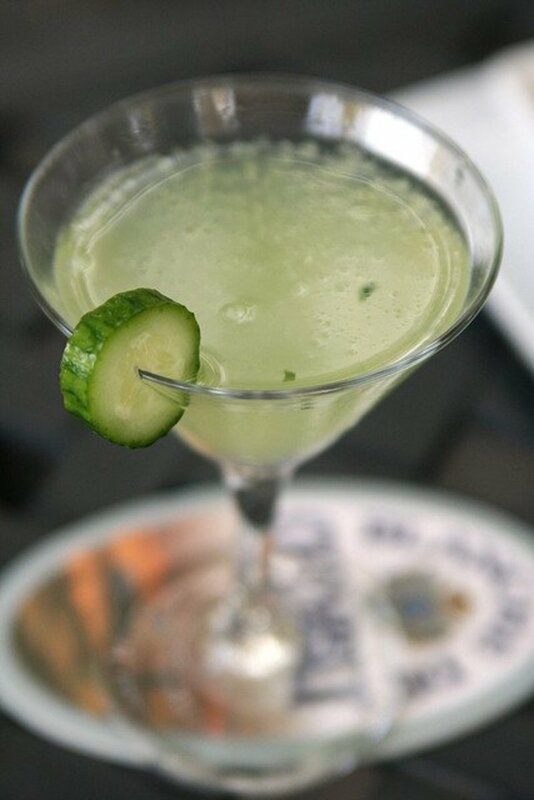 You want the lime and mint to be evenly spread throughout the glass. 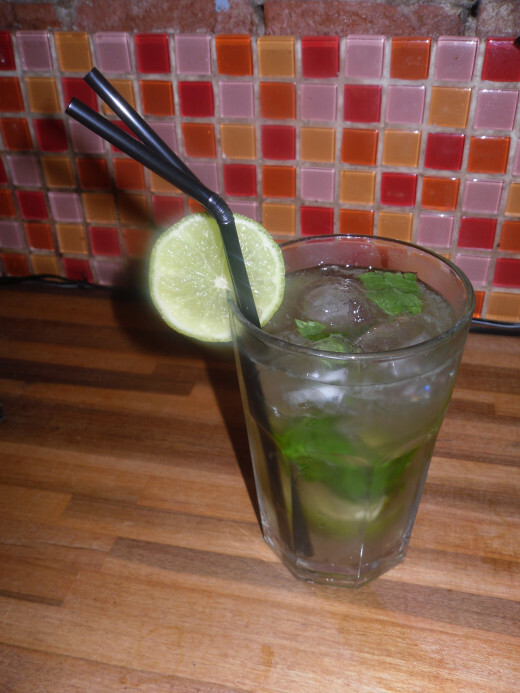 Stick in some straws, add some decoration, and you have a Mojito! 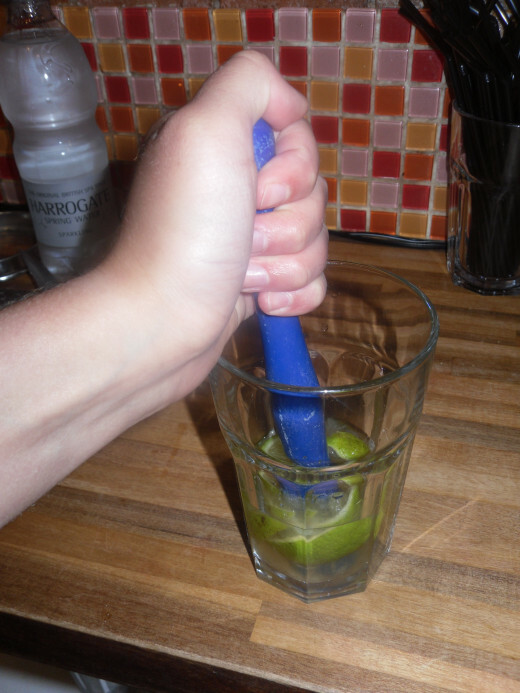 To decorate your Mojito, cut a circle of lime, slit a line to the centre of this and slot over the side of the glass. Put in a few straws on the same side. If you feel like showing off a bit, why not sugar-rim the glass too? Before making the mojito, spill a thin layer of sugar (of any colour) onto a small plate. Then, cut a small piece of lime and rub this around the rim of the glass. Press the rim of the glass into the sugar and it should stick to the lime juice. Ok, so technically, if you don't use white rum, then it's not a mojito...but the lime and mint flavours make this cocktail very versatile. 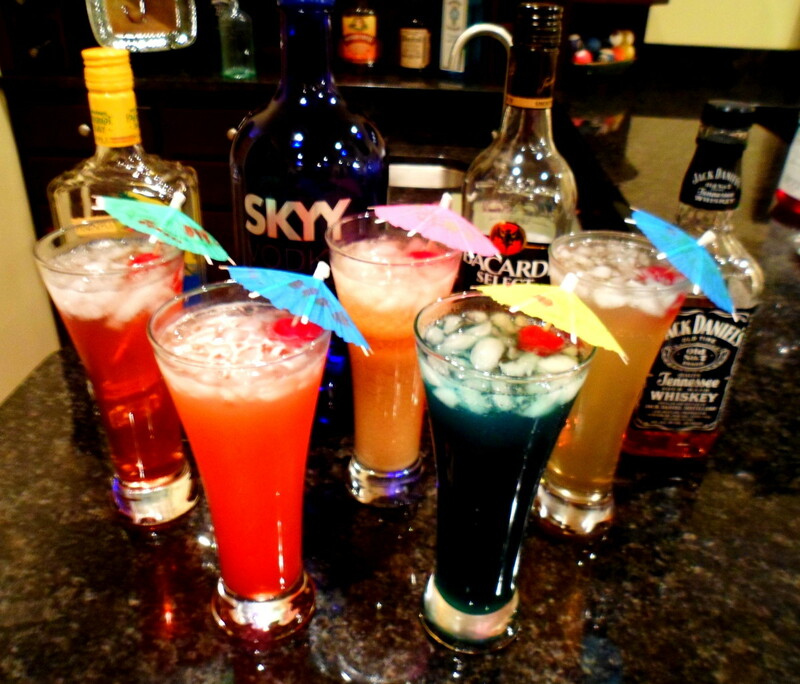 You can try adding all sorts of spirits and flavours, just experiment and have fun! 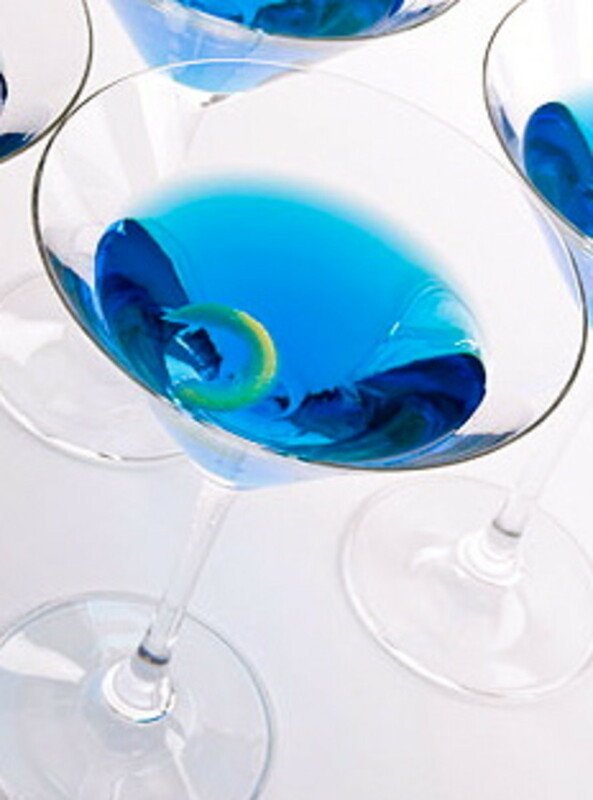 Try adding different spirits if you're not a rum fan, such as tequila or vodka. Spiced rum such as Sailor Jerry's or Captain Morgan's make a sweet twist on the classic mojito. 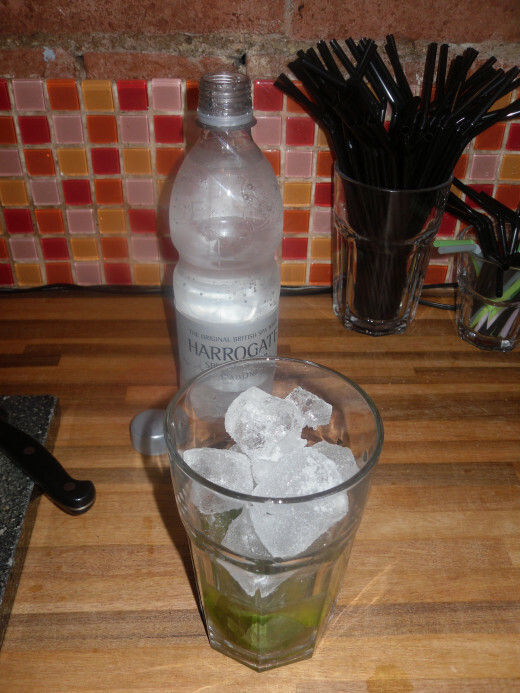 If you have a sweet tooth then use extra sugar and top with lemonade instead of sparkling water. 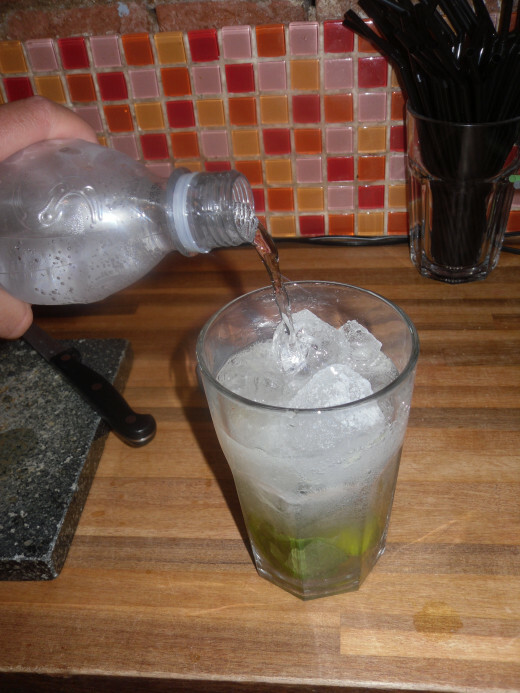 You can experiment with lots of different flavours of mojito. Try using different fruit juices such as passion fruit or cranberry juice, instead of sparkling water. (These will be still drinks, if you want to keep it carbonated, then go half and half with the fruit juice and lemonade/sparkling water.) 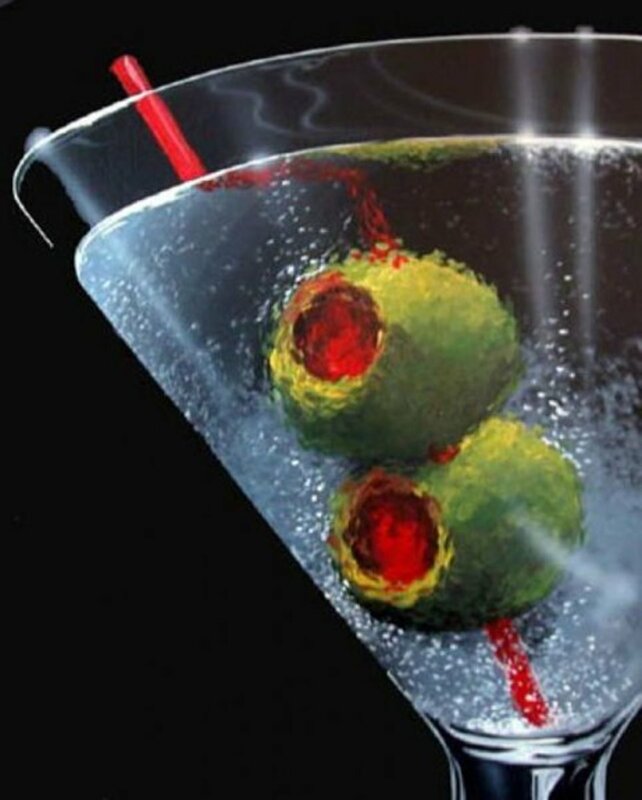 Or, add a few pieces of fruit to the drink with the mint, such as raspberries. Named after a beach-side town in Mexico, this is the perfect summer cocktail. Designed to look like a morning sunrise, this cocktail is a strong-but-sweet cocktail containing similar ingredients to that of a margherita.